This type of application applies to connecting a new single dwelling house on an existing lot, or one-into-two lot residential sub-divisions with a single dwelling house on each lot. Your property is situated on a State Controlled Road -Transport and Main Roads require special permits and will want to review and approve design before they will approve permits for contractors to carry out the work. Once you have gathered all information listed above, you can apply through the Development Applications Portal. Once your application fees have been paid, our team will assess your application. We will assess your application and provide a Decision Notice within five business days. We will provide a quote for the construction of the connection within a further five business days. More information on time frames can be found in our service commitments. 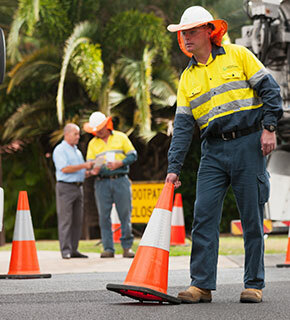 NOTE: During your connection application you will receive emails from no-reply@urbanutilities.com.au. Some email servers may block this address, so before commencing your application please check your security and spam settings. 3. next steps in the connection process. If we require further information from you, we will issue a request for information by email and you will need to lodge the additional information on the Development Applications Portal. Once we receive payment, you will be contacted by our authorised contractor within three business days to arrange a suitable time for your connection. The construction works will be commenced within 25 business days. After construction is completed and all applicable fees and charges paid (including your quarterly water and sewage bill plus Infrastructure Charges if applicable), we will issue you a Connection Certificate and As Constructed plans. Small subdivisions will need this certificate as part of the plan sealing (final approval) process with councils.